A Eurasian beaver from Sweden, the same species as the one discovered in Devon. Credit: Janos Jurka. A mystery beaver sighted in Devon could be the first case of the wild animal in England for 800 years. A rogue beaver has been spotted living on a farm near the River Otter in Devon, centuries after they went extinct in the UK. Beavers used to be an important part of wetland ecosystems across Europe, but were heavily hunted for their fur and their throat glands, thought to be medicinal, disappearing from England and Wales in the twelfth century. 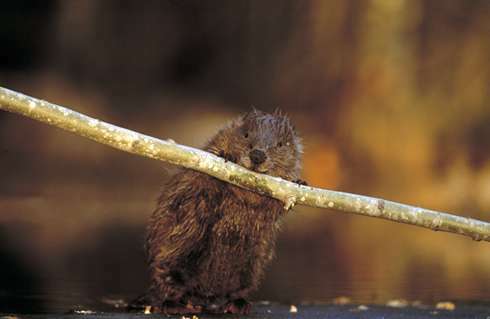 Countries across Europe have been reintroducing the beaver since the 1920s. Britain is one of the last regions to begin reintroduction, but there are now several controlled trial projects around Britain, including in Devon, Kent and Gloucestershire. It's a mystery, however, where the beaver caught on amateur video appeared from. The Devon Wildlife Trust is nearing the end of its three-year project to introduce a pair of beavers into an enclosed wetland area. The pair had a baby, known as a kit, in August 2013, but none of the three is reported missing. Museum mammal curator Richard Sabin says beavers are remarkably good at escaping and surviving in the right environment, and that they can 'gnaw out of pretty much anything'. 'The beaver in Britain was, and still is, considered to be an important part of the ecosystem, and was certainly responsible for significant modifications to local and wider environments, through the damming of rivers since the end of the last ice age,' said Sabin. The Museum hosts the best collection of complete examples of the extinct indigenous British beaver. 'Our specimens date back several hundred to several thousand years and were found as well-preserved skeletons in peat from fenlands in the east of England,' said Sabin. A beaver reintroduction trial is currently running in Scotland, where a total of 16 beavers have been released in the highlands since 2009. The Museum's collection contributed data to the selection of candidates for the trial from living populations of Eurasian beavers. The five-year project will come to an end this spring, after which a scientific report will be filed and the Scottish government will decide whether to continue the trial, remove the beavers entirely, or allow them to remain free on the land. The Devon Wildlife Trust's beaver trial is monitoring the impact the beavers have on the hydrology, biology and water chemistry of the wetland site. At the end of the trial, the beavers will be removed from the land until the results are interpreted. Do beavers benefit Scottish wild salmon?